My Free Spirit girls wanted some pets, so I decided to apply hook and yarn to making them some puppy companions. So far there is a German Shepherd, Border Collie, Beagle, Labrador, and Cavalier King Charles Spaniels. They all have the same basic body and legs. The puppy heart and soul is in the face...ears, eyes, and muzzle. Here are the patterns to share with all of you. These would also be fun gifts or stocking stuffers, for both boys and girls. You are so generous!! Thank you for sharing your talent and love of crochet!!! I just love the Victorian Series!!! Thank-you so much for your kind comments. You are just amazing, whipping out all these patterns. And your readers are most grateful, but WOW woman. 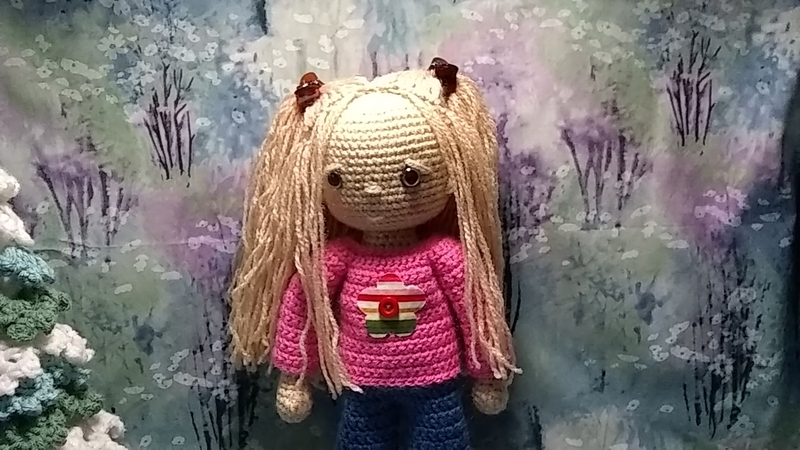 I am making my first doll, have 1 more arm to crochet then put her together. Hopefully I will have 2 done with outfits for a pair of sisters for Christmas. Now, they will each need their own pet too. Will send pics when I am done. 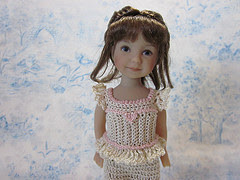 Cheryl and Martha, thank-you for your wonderfully kind words :-) I'd love to see your creations when they are done, and please post a picture of your Free Spirit doll on the Free Spirit photosite. I can't wait until I have some time to make at least one of these. Too freaking cute. Thank you SO much for another awesome pattern! They are fantastic ! LoL! thank you for the follower bar, and sorry my bad english, but your doll are too lovely I can't don't write a comment! Thanks so much for sharing! I have been looking for a pattern for a puppy to make and give with a book that has a puppy as the main character. None that I found were nearly as adorable as these! I can't wait to get started! Wow. I've become a Follower as I just love your adorable creations. A friend on a Bleuette doll group told me about your site. I've just begun to look. I collect mostly Chatty Cathy and American Girl dolls, but this year became interested in Bleuette. Please visit my blog when you get a chance. I have lots of doll photos. Thanks for your kind comments too! Thank You Thank You Thank You for doing the Cavs!!!!!!! These are absolutely adorable. Thank you for sharing this. Wow. they r too cute i was looking for a basset hound pattern to make but i justhad to download these to try them out...thanks for sharing them!! I am trying to make a kitten for my daughter but getting very stuck on the left ear. For some reason I can't work out what it means after you get to row 4. When you chain the 3 do you do the 2hdc in the st of the row you just completed and if so where does that make the tip of the ear? Any advice!! Looking at my instructions I can see it is a little confusing. For the left ear, at the end of row 3 I should not have said to chain 1 and turn. If you ignore that and then go to row 4, ch3, and work the 2hdc in the next stitch of row four, and so on. The tips of the ears are row 1. What I was trying to do was slant the bottom of the ear so it would fit the head better, instead of 'perching' the ears on top of the head. Does this help? If not, email me at dollmaker46203@gmail.com and we'll get it figured out. Your puppies are so adorable. Please let me know if you make a Boston Terrier! WoW! Thinks for posting all these patterns. I absolutely LOVE making Amigurumi. I am from Ohio and created a OSU Brutus pattern. Is there any chance you'd create a small afghan square of a Cavalier King Charles Spaniel's head or whole body? I've been looking forever for a small design that I can incorporate into scarves, hats, etc. Thank you for your beautiful work, and sharing! Sharon, my talents don't extend to being able to draw worth a darn, and an afghan square as you describe sounds like a job for a cross stitch type of skill. Perhaps you could scan a picture and then run it through a cross stitch or needlepoint pattern software. Annpan, that is awesome! As you could probably tell, Neil Armstrong is my hero. Those men (and now women) who are astronauts and cosmonauts embody all that is good and decent in us as a human race. Today I published the first of your puppy patterns (the labrador) in Swedish on my blog. Now I'm very excited about the response to it. I hope the Swedish crocheters will love it as much as I do. Cissi, Thank-you for letting me know! Hi Beth, What an extaordinary site. The puppies are adorable. The Free Spirit doll is darling. My first great granddaughter is due on February 14th and she will definitely get one of these dolls. Thank you ever so much for your generousity. You have an amazing talent! I am putting you on my favoites list immediately. The best of everything to you. Thank-you so much for your kind words, Paula and Nancy. 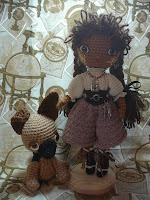 I'm delighted that you enjoy the site :-) I hope you both have a very blessed 2010 with lots of time for crocheting! I just love these little puppies. I've seen some of your work and I absolutely love it. I'm one of the Editors with FaveCrafts.com, a DIY and crafting web site. We offer hundreds of free craft projects, patterns and tutorials. I was hoping you might want to contribute this craft project to our site. I believe our readers would just adore this or any other pattern you wish to submit. Not only would our readers see it on the site, but it would be published in our bi-weekly newsletter which goes out to over 450,000 subscribers. You are so blessed with talent! I love your patterns and hope to make your adorable puppies and kitties for my granddaughters. I'm just in "awe" of you and am so thankful for these wonderful free patterns! Can't wait to see what you create next. Wishing you a very Happy New Year!!!! Hello Susie, thank-you so much for your kind words; they warm me up on such a cold day (12F here, with a cold North wind). I hope your Grandkids like the puppies and kitties, and that you enjoy making them. I know they have given me a lot of pleasure, both in the making and the sharing. THANK YOU SO MUCH!, for these lovely patterns. Your my heroe! The world needs more people just like you! Thanks!!!!!!!!!! Also I look forward to anything else you make. Your work is amazing, beautiful, and brilliant! Your work inspires me to do more than just make hats and scarfs ,but to make art. Making lovely animals relaxes me very much and is way better than wasting my time watching tv. Like I said your my biggest heroe and I look forward to anything new if possible. Becca, thank-you so much for your sweet words. Like you I find crochet to be very relaxing, and making a little doll or animal is so rewarding :-) It is my favorite kind of crochet. Hi from Finland! So wonderful that you share these with everyone! Thank you so much! These are the cutest I've ever seen. You are so talented. I'm trying to get a pet for each grandkid done for Easter. I just finished the Cav and he is darling! I am now working on your Siamese kitty pattern and she is almost done. The Beagle is next. Thank you so much for sharing these at no cost to us! You're so good, you should be published! Thank you Marrit and Debbie, for your good words :-) I can just imagine how cute these little pets would be in an Easter basket. Beth, you are too terrific! Such talent, and such adorable talent! I love your crochet creations. I still want to join your mailing list and/or email, but can't find how to on your site. Thanks and keep up the beautiful work! I'm don't know why clicking on the 'Follower' button does not work for you. Maybe Google has hiccups, and you can try it again tomorrow. (copy and paste it into your browser), then click on the little yellow envelope toward the top of the page. who own this site? if this is hollies then i went to the right one!!! i love this site! it is so cool ! im making the dog right now!!!!!!! Thanks so much for the patterns. I am taking a shot at the puppies. Now all I need to do is track down some animal eyes. None of the craft stores here seems to have them?!? I'm having trouble with the ears of the cavalier pup, for row 2 should I loop stitch around the whole ear? For row 2 of the ears you work loop stitches back across the six sc you stitched in row 1. The loop stitches are worked in every other row, and you work back and forth across the rows, not around the entire piece. Thanks Beth! !It helped alot the ear looks great now! Great collection! 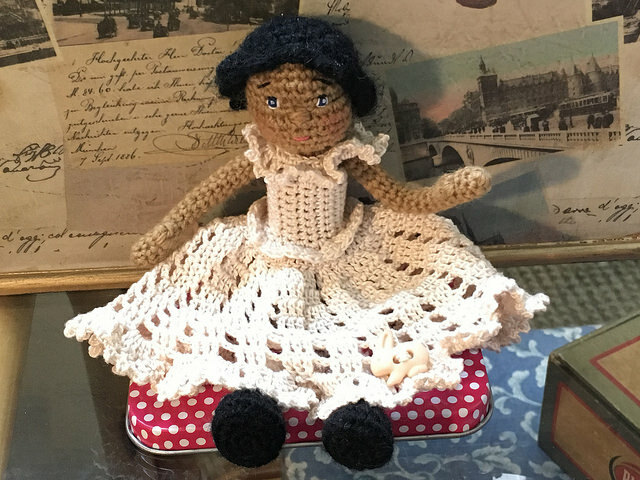 I bet you pick up lots of new traffic for sharing these, now that they've been discovered on Crochetville! I like to use the hair bands so that pants and skirt will fit tightly around the waist without needing to use a button, snap, or ties. What you could do is chain a long chain (say 60 or 70, enough to go around the waist and also tie a bow), then work the number of waist stitches called for around the middle of this chain length, leaving long ends on either side to tie around the waist. Lilypad, so far I haven't needed to wash them. If I did, I would do it by hand and very gently, and with a gentle detergent. If you look on the left sidebar of this blog down toward the bottom there is a section called "Links I Love" which has a link to animal eyes and to Suncatcher eyes. Just wondering.... How do you do the eyelid on the Cavalier King Charles Spaniel? The eyelids are simple, just three straight stitches across the top of the eye, slanted down to the outside of the eye to give that 'puppy dog' look. 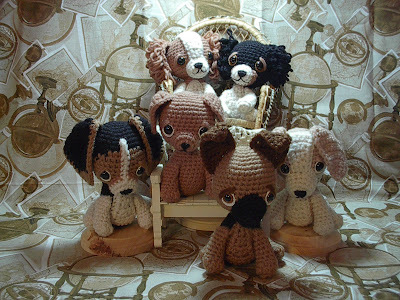 i just found these cute dogs to crochet and the pattern that is posted isn't right at all, no offense. My mom has been crocheting for 18 years and knows when a pattern is screwy. She's working on the labrador and she is having to re write the pattern because it is unclear on what has to be done. for example: it says the puppy is 5" tall sitting, the head itself is 5". The head doesn't match up to the pattern. Is this just a typo on the pattern or something else... Please help me understand all this confusion in order to make these adorable dogs for my sister. I'm sorry to hear you are having so much trouble with the pattern. No offense, but I do not know what the problem may be. I've used the pattern many times, as have many others, without issue. Check your crochet gauge; maybe you are crocheting too loosely. I crochet very tight (so the stuffing won't show). You could try using a smaller hook. You are a godsend! I have hunted high and low for a cute n beautiful puppy pattern for free for easily 3 months with no success...until now! Thank you so much for sharing such a fantastic looking pattern. I will definitely be trying these out. Thanks again! Thankyou so much for your patterns. I'll be working on one of these puppies as a present for a friend who recently had their poor old dog die. I'm looking forward to getting it done! I have downloaded the collie puppy and after doing the head it does not look like the one in the picture as you have two colors on the head and mine only had one and there is no discription on how to do this. can anyone help plesae. The blaze on the face of the border collie is worked as a separate piece with the muzzle. When you crochet the muzzle, you will crochet the blaze as well, then stitch this to the face. I was wondering what your policy is on selling the completed items from your patterns. My family is opening an etsy store and I wanted to ask before I did anything. We will gladly give you the credit for the patterns. You may sell dolls made from my patterns, but I would ask that you give me designer credit on your hangtag. Please do not sell the patterns themselves; but it doesn't sound like that is what you are planning. Good luck on your Etsy store! Hello Beth, I just love your puppies...I just started crocheting this February. I saw your puppies and at first I was really reluctant to try something so hard...but they were just to cute to resist...so I made these two. I use to have a dalmation and she is gone now...so I had to make one a dalmation. I have the photo's on my blog...I just wanted to give you credit for your wondeful patterns...thanks for sharing. Hi beth, I love your work. My name is Ana and in my blog I translate English crochet patterns into Spanish. One of my followers asked me to translate this patterns. If you are agree with the translation I'll link this page and give you public thanks. Please contact with me for more information. Take care, and have a lovely evening (or morning, as it is). I really love these puppies as well as the kitties. However, I am confused on the muzzle/blaze of the Cavalier King Charles puppy. "Sc in next four sc to bring you to the top of the muzzle, Join, ch1, sc in same st and next st, ch1, turn." What do you mean by "Join"? I'm still fairly new at crocheting so I don't understand. If *anyone* could help me out ASAP that would be great! Joining is usually accomplished with a slip stitch. To 'join' is to insert your hook into the indicated st and work a slip stitch. Now you are ready to ch1 and begin the next row of stitching. Thank you for the help. :D It really helped and I have now finished the muzzle/blaze. But now, I have a quick question about the ears. After I complete the first step on the ears, I have a circle. But, looking at the next step, it seems that I should be working in rows and not rounds. Will this circle eventually straighten out? Or am I supposed to be working in a circle? Or did I just mess up somewhere?? Actually, you will be working in rows. After the first row is made, you turn the work, instead of working around. And, it will straighten out as you continue making the ear. Is it okay to sell the cats that we've completed with your pattern or are they only for our private enjoyment and give-aways? By the way, your patterns are lovely and I have enjoyed making a few of them. I am happy for you to sell what you make from my patterns. My only request is that you give me design credit on your hangtag. I have just found your Cavalier pattern and they are precious. I machine embroider blankets for Cavaliers by Crumley and I would get a kick out of making these for the owner. How hard would it be to make then a little larger? I guess I would be classified as an advance beginner in crochet. I done it for years but just afghans and baby blankets. 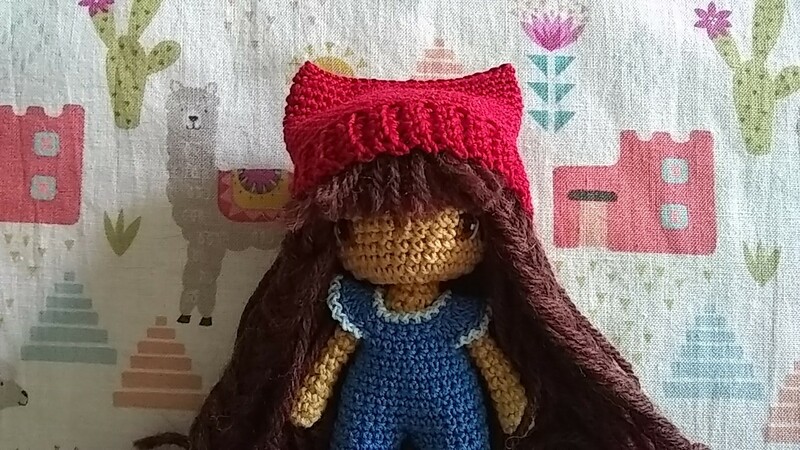 This past year I have gone crazy over the Amigurumi. The grandkids just love them. Thank you so much for making your patterns available to us. The easiest way to make these bigger would be to use a thicker yarn. Since these pups are all made with worsted yarn, I would suggest a bulky weight yarn and a G hook. This may seem like a small hook to use with bulky yarn, but you want your stitches to be really tight, so no stuffing shows through. If you want to download the pdf Spanish pattern, clic over the image. thank you so much for your generosity... been a huge fan since seeing your spirit dolls years ago.. thank you again! Thank you for all the lovely patterns, without sounding redundant. With so many people charging first just a few dollars for patterns. People have become ridiculous with their prices. Thank you for your good words, Judith. I do have a question about the Cavalier's muzzle though. The first step says, " Ch3, three sc in second ch from hook, six sc in last ch, three sc on opposite side in same ch as first three sc." I can't figure out where you want me to put the six sc. It says "last ch" but I'm not really sure which ch is the "last ch." Instead of 'last chain,' it could say 'next chain.' So, you work three sc in the second chain from the hook, then six sc in the next chain (which just happens to be the last chain of your beginning chain three). For the next stitches, you are going to work in your beginning chain three, but on the opposite side from where you have worked your first stitches. This way, you have sc stitches on BOTH sides of the beginning chain. This will give you an oblong shape for the muzzle of your puppy. Thank you. That does help a lot. Although, it's probably just my yarn, I'm having a heck of a time finishing this row with all 12 needed stitches showing. They keep over-lapping no matter what I do. I guess I will just need to find a way to get by with only 10 or 11 stitches in that row, unless you have another suggestion? Your patterns are just beautiful. They are all so precious!! I will have to try and make on of these cuties. Thank you for sharing your talent and being generous in sharing your pattern with us. Hi!I'm 12 and i absolutely love both dogs and crochet! I'm so glad i found this! I cant wait to try out the Labrador since i also have one but I think I'm going to change the color to whitish-gold since Labrador is like that. Just a thought. Do you have dogs and cats of your own? Hi Gokudera! I think your color for the Labrador is great! We have four cats that we love dearly! Enjoy making your own puppy! Thank you SO much for sharing your wonderful patterns! those puppies, soo adorable. I have made 3 so far ( see them at my blog http://lilyarncreatures.blogspot.com/2013/03/puppies.html) and I am working on a purple wolf using your german shepard pattern for my friend(im a nerd). love your patterns! I just had a few questions on the pattern. Sorry if they were already answered. In regards to the eye whites: is perle cotton the same as crochet cotton? Also as far as the embroidery and "eyebrows" (not sure what to call them) how do you tie of the ends since the head is already stuffed and closed. Perle cotton is shinier than size 10 crochet cotton, but size 10 will work just as well. As for any embroidery that I do on stuffed crochet, I just bury the ends into the body of the work...they have never worked loose yet! Thank you for making these! My best friend just lost her chocolate lab to cancer. And another friend just got a black lab. I have a yellow lab. So I've made all 3. I also have a golden retriever and . chow chow. Could you try to make those? I am no go at altering pattern myself. And as far as cats go I have an american bobtail if you could make one of those. Thank you. Feel free to email me anytime. At emmyd.93@gmail.com. if I put your name on the tag do you mind if I sell some products in my moms thrift shop? You certainly may sell items made from my patterns, and I do appreciate you asking, and puttng my name as designer on your hang tag. As for making a Sheltie, all I would do is take the Border Collie pattern and use a fuzzy yarn, like mohair or eyelash, to crochet the body and give the long fur look. You could do this to. These patterns are amazing and super cute - i would love to make a dog but in the appearance of a welsh springer spaniel, is there an easy way to adapt one of your existing patterns to this type? Oh my! These doggies are fabulous. I want to make them all!! Thank you so much! And the little girls are very cute too!! Hi Nikki...if you will send me your email address, I will send you the patterns. I was wondering if you would ever put up a pattern to make a dachshund? Beth, I've been meaning to reach out to you and tell you how very much *good* your generosity with your patterns has done! 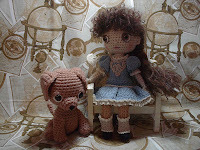 Since Oct. 2009 I have been crocheting little pups, using your patterns. I donate them to animal rescue organizations for them to sell for charitable donations! They sell like hotcakes, generating lots of $$$$$ for the shelters and I cannot keep up with the demand. You sure did "pay it forward" with your talent, creativity and generosity! Your puppies are insanely cute! Thank you. Muchas gracias por sus patrones, bendiciones y buena vibra. Muchas gracias por los patrones. Son adorabies!!!!!!. Muy generosa!!!!! Abrazo desde Buenos Aires!!!! Gracias por tus buenas palabras! You are amazing. 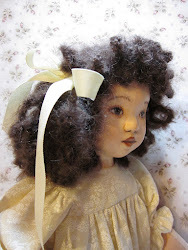 I can't wait to crochet Bluette in all her glory and doll her up in different ways. I'm so excited to have found you, wonderful, absolutely wonderful work. Can I please have your permission ?? I would be delighted for you to translate the pattern for these dogs into Dutch! If you would include a link back to my blog, that would be great. And, if you want to send me a link to your translated pattern, I will put it here. My email address is: dollmaker46203 [@] gmail.com Just remove the brackets and write it all as one. I have added your Dutch translations to the left sidebar where all the puppies and kitties are. Thank you so very much for this hard work! I just downloaded it and had no problem. 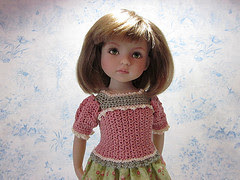 If you continue to have an issue, email me at dollmaker46203@gmail.com and I will email you the pattern.